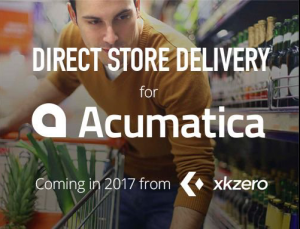 Leading software developer and ERP consultant, xkzero, announced today plans to offer a fully-integrated direct store delivery (DSD) & ERP (enterprise resource planning) solution for food and beverage wholesale distribution by integrating xkzero Mobile Commerce with leading cloud ERP system Acumatica. The solution is expected to be ready for market in the second half of 2017. Initial target industries for the solution will be beer distributors, wine & spirits distributors, grocery wholesalers, milk and dairy, salty snacks and bakery products. Mobile Commerce by xkzero is a flexible mobile app and web-based platform designed to optimize mobile sales, route delivery and intelligence gathering while unifying back office accounting and customer service. Food and beverage companies are able to automate and integrate functions such as Truck Loading, Route Planning and Scheduling, Route Selling, Delivery Automation, Compliance Tracking and Reporting as well as gathering new intelligence. xkzero specializes in integrated mid-market ERP systems for wholesale distributors and manufacturers who rely on mobile sales, route sales and direct store delivery automation as a means of distribution. xkzero is a certified consultant and developer for Sage X3, Sage 100 and Acumatica, creating integrated and embedded mobile solutions into some of North America’s most popular and powerful ERP and accounting systems for the mid-market. Find out more at xkzero.com. Acumatica is a leading provider of cloud business management software that empowers small and mid-size businesses to unlock their potential and drive growth. Built on the world’s best cloud and mobile technology and a unique customer-centric licensing model, Acumatica delivers a suite of fully integrated business management applications, such as Financials, Distribution, CRM, and Project Accounting, on a robust and flexible platform. In an interconnected world, Acumatica enables customers to take full control of their businesses, play to their organizations’ unique strengths, and support their clients by following them anywhere on any device. This entry was posted in Direct Store Delivery, Mobile ERP, Revolutionize ERP by Paul Ziliak. Bookmark the permalink. © 2009 – 2019 erpappsblog.com and xkzero. See our newer posts at xkzero.com/blog.